The ‘Food Hygiene Rating Scheme’is a local authority/Food Standards Agency partnership initiative. choices about the places where they eat out or shop for food thereby encouraging businesses to improve their hygiene standards. to be re-assessed for a ‘new’ rating. Scoring is based on the following categories. Confidence in management / control procedures – how the business manages what it does to make sure food is safe and so that the officer can be confident standards will be maintained in the future. Food hygiene and safety procedures – how hygienically the food is handled – safe food preparation, cooking, re-heating, cooling and storage, staff training. Food premises structure – the condition of the structure of the premises – cleanliness, repair, layout, lighting, ventilation and other facilities. 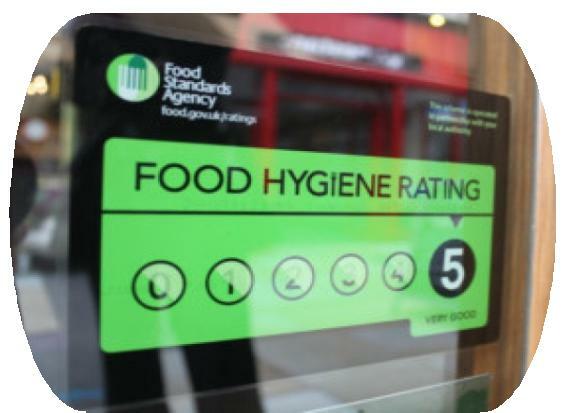 The rating is only about the hygiene standards of the food business – it is not about the quality of the food or about the standards of service provided to customers. Any business, no matter how small should be able to achieve the top rating of 5. The scope of the law currently extends to establishments supplying food direct to consumers – this includes restaurants, cafes, takeaways, sandwich shops and other places that people eat food prepared outside of the home, as well as food retailers.